Earth’s career, like its music, has always been a slow, deliberate progression. Each record slightly removed from the last, a constant refinement of a singular vision. Dylan Carlson has remained focused throughout on coaxing moments of strange beauty and reflection from “the riff”. This elemental foundation of rock is refracted, in their earliest recordings, through the prism of sheer volume & feedbacking drone or, in the twin Angels of Darkness, Demons of Light set from 2011 & 2012, via a sparse unraveling take on folk. With Primitive and Deadly, Earth’s tenth studio collection, Carlson & long term foil, drummer Adrienne Davies, manage to pull off the trick of completing an Ouroborean creative cycle, 25 years in the making, whilst exploring new directions in Earth’s music. For the first time in their diverse second act, they allow themselves to be a ROCK band, freed of adornment and embellishment. As much as Carlson’s guitar has always been the focal point of Earth’s music, it’s been surrounded by consistently diverse instrumentation. Here the dialog between Carlson and Davies drumming remains pivotal, underpinned by the sympathetic bass of Bill Herzog (Sunn 0))), Joel RL Phelps, Jesse Sykes and the Sweet Hereafter) and thickened by additional layers of guitar from Brett Netson (Built To Spill, Caustic Resin) & Jodie Cox (Narrows). Perhaps the largest left turn on Primitive and Deadly, though, is prominence of guest vocalists Mark Lanegan and Rabia Shaheen Qazi (Rose Windows) who transform the traditionally free ranging meditations of Earth into something approaching traditional pop structures. On Rooks Across the Gates, a song stylistically the closest to the folk inspired modality of Angels of Darkness, Carlson stretches out into some of his most lyrical playing to date, creating an almost symbiotic relationship between his performance and the vocals of old friend Mark Lanegan. From the Zodiacal Light, meanwhile, takes the late 60’s San Franciscan / freaked out jazz-rock transcendence of Bees Made Honey in the Lions Skull and quickly re-appropriates that sound into a musky torch song for the witching hour. This contradictive tension between a band pushing themselves ever forward whilst surveying their history is reflected in the albums twin recording locales. The foundation of the record was laid in the mystic desert high lands of Joshua Tree, California where Earth recorded hour after hour of meditations on each tracks central theme at Rancho de la Luna. Upon returning to Seattle these were edited, arranged and expanded upon at Avast with the help of long-term collaborator Randall Dunn (who was previously at the helm for the Hex, Bees Made Honey in the Lions Skull and Hibernaculum sessions). Thick, dense and overdriven, melodically rich & enveloping, Primitive and Deadly is Earth reaffirming their position as a singular point in the history of rock. Reverent as it is prophetic and stark, King Dude has previously shared his spiritual visions with releases on Dais, Avant!, Bathetic, Clan Destine, and Ván records. 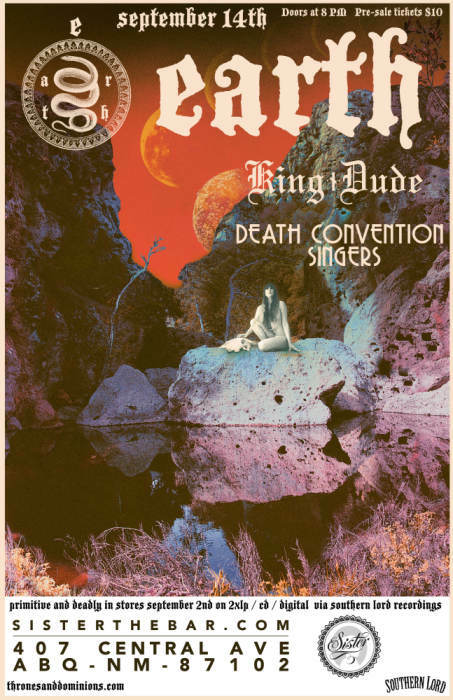 Pulling together the biblical sound and isolation of the bygone days of revelation with an atmosphere filled with hope and salvation, King Dude has woven his own brand of American music. He brandishes many varied influences in his songwriting. Everything from British Folk, Americana, Country and Blues can be heard in his songs. Even the heavier sounds of Heavy Metal tend to sneak and slither it's way into the King Dude canon. The resulting songs are much more of a modern day hymn then your average pop song. 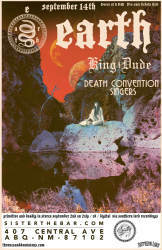 King Dude's music beg's the soul to lift itself up from the darkness of ignorance, towards the ever shining glorious "Light" that exists outside of all of us yet that which we are eternally connected to and at once connects everyone on Earth.